Congrats to Joyce L. who beat out Jonalyn by one stroke as ProThrowbacks Employee Golf Day Champion. Thanks to our sponsors Eesop and "the Waterboy" for taking care of the fun stuff. Lucky for Joyce that Annaliza had to work that morning and Ella was late for the competition. You can visit Joyce and Annaliza at the Clark Sun Valley Golf Course and get some pointers on the short game while Karla, Ella, and Jonalyn can show you how to hit for distance in our golf simulator at our store inside Pure Gold Clark located at the Clark Freeport Zone. ProThrowbacks former Golf Manager Alona Santos awards new driver prize during sponsorship of the Korea vs Philippines golf tournament held Mar 2013. 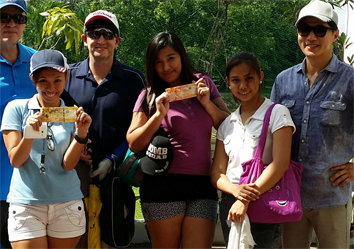 Alona's first time to play the course representing the team Philippines was no match for the strong Korean teams. A good time was held by all. OK old timers, just a friendly reminder, the 2nd Thursday of the month to test your golf skills. See you there! If you're 55 years of age or older, you can join, for additional information click here. Also, you can check at Mimosa Seniors golf website direct. A little confused? Well, the Mimosa Seniors changed their home course to Pradera Verde. A new website will be built to cover the Pradera Verde Seniors. Please contact us and we'll send you this image free of charge for your upcoming golf tournament. This is a great way to add to your golf goodie bag before golfers start to begin play. For fund raisers, you can charge a little money for the Mulligan's. If you have a golf tournament and want it online for free, please send us the information and we'll post it here.